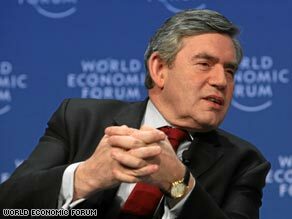 DAVOS, Switzerland (CNN) -- British Prime Minister Gordon Brown has called on world leaders to set about reforming international financial institutions to prevent a repeat of the circumstances that led to the current financial crisis. Gordon Brown said governments were dealing with the "first financial crisis of the global age." Speaking to CNN's Christiane Amanpour during a session Saturday at the World Economic Forum, Brown said leaders would have failed unless they used the crisis to build a "greener, more digital and more highly skilled economy." Brown also said the world needed a new Bretton Woods agreement, referring to the 1944 conference that laid the foundations of the post-World War II economic order by creating the World Bank and the International Monetary Fund. "We've got to be far bolder and far more imaginative," Brown said. "We want to create a global society. But we need to have global institutions that work and the problem is the institutions we built 60 years ago are out of date." With world financial ministers due to gather in London in April for the G20 summit, Brown said governments were dealing with the "first financial crisis of the global age." When does Davos think slump will end? "There is no clear map from past experience for how we deal with it. We are learning about new problems for which we have no historical analogies to fall back on," he said. Brown said it was essential to restore trust and confidence in the financial system and echoed German Chancellor Angela Merkel's call for the creation of an international regulatory system that would curb "short term irresponsible risk taking and excess." "The Latin word for credit is the same as the Latin word for belief or trust and this is a crisis of confidence in the banking system. We've got to rebuild around common principles that every sensible person would support," he said. The British banking industry has been among the worst hit by the crisis with the government stepping in to rescue several major banks, including Northern Rock and the Royal Bank of Scotland, from collapse. But Brown said it was essential to coordinate international efforts to get banks lending again and warned that developing countries would be damaged by the withdrawal of credit and investment. "The countries that will suffer worst if we don't take any action are the poorest countries," he said. "They will be deprived of capital and no one will be prepared to invest in them." Meanwhile, Brown dismissed calls for his government to act to protect the value of the pound, which has slumped against the euro and the U.S. dollar in recent weeks amid fears over the strength of the UK economy. "We do no target our exchange rates. The history of targeting exchange rates has been a recipe for failure over the past 20 or 30 years," he said.